RUSSIAN ISLAND/TASTE OF EUROPE is located AT 1901 W. Pioneer Prkwy, Arlington TX, 76013. You can find us by our sign TASTE OF EUROPE on the North side of the parkway. We are open Wednesday thru Thursday 5pm to 10pm, and Friday thru Saturday Noon to 10pm. Monday and Tuesday we are closed. 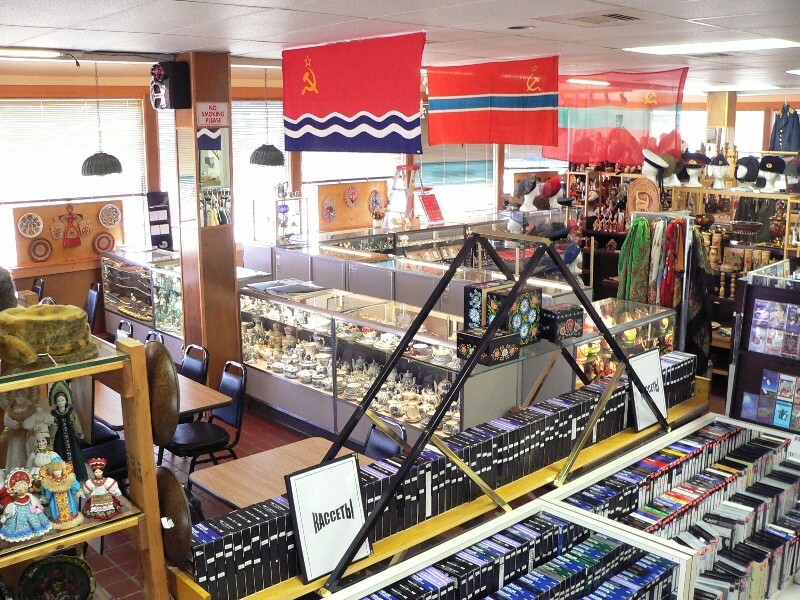 In our store we offer the biggest variety of gift items and collectibles from Russia and all former USSR territories. We have over five thousand different items in RUSSIAN ISLAND/TASTE OF EUROPE store, but in the web site we show just examples of the merchandise we carry. Please visit Russian Island/Taste Of Europe when you are in Arlington and you will not be disappointed. Our knowledgeable and friendly staff will answer all your questions about the Russian culture, art, history, or any other aspects. You need to see it to believe it. The Russian Island/Taste Of Europe Store brings you the best in imports from Russia. Come in and shop for those distinctive and hard to find items. We have items that make the perfect gifts for all budgets and tastes. Also, you are welcome to visit other pages of Russian Island - your best source of Russian Internet shopping for Russian gifts, Russian collectibles, Soviet military, Soviet memorabilia, Russian souvenirs, Russian antiques, Russian dolls, Russian jewelry, etc. On our web site you will be able to find famous Russian nesting dolls, which are also known as Matrioshkas, matrioshka dolls, Matryoshkas, matryoshka dolls, Matreshkas, matreshka dolls, nested dolls or Babushkas. We also have unbelievable Russian lacquer boxes from Palekh, Mstera, Kholui, and Fedoskino and absolutely beautiful Russian jewelry, including amber jewelry, enamel jewelry, Faberge eggs, and Russian wrist and pocket watches, along with fine Russian Blue cobalt porcelain, and all of these collectibles are well known all over the world. Collectors can also enjoy the biggest variety of Russian collectibles such as Soviet and Russian medals and orders, Soviet and Russian official badges, Soviet Navy, Army, and Air Force uniforms, hats, visor caps and hats, overcoats, military belts, Naval shirts, Army field shirts - which are also known as gymnasterkas. Also, you can find plenty of sports memorabilia such as Soviet and Russian hockey jerseys and badges and we also have the best selection of Soviet flags, banners, and posters. Do not miss the collections of Russian and Soviet books, stamps, first day covers, envelopes, paper money and coins. We also have Russian Military Patches, Soviet Military Patches, USSR Military Patches, Russian Air Force Patches, Russian Border Guard Patches, Russian Police Patches, Russian Special Forces (Spetsnaz) Patches, Russian Navy and Marine Patches, and other Soviet Union Patches. The antique lovers will find such antique collectibles as old Russian icons, samovars, photos and documents, Old Russian currency and coins, and other Russian unique items. Among some of the most popular Russian gifts and souvenirs that we offer are Russian nesting dolls, also known as Matrioshkas, matrioshka dolls, Matryoshkas, matryoshka dolls, Matreshkas, matreshka dolls, nested dolls or Babushkas, and are all hand made dolls. There are even all kind of Russian, Ukrainian and Belarussian hand painted Russian lacquer boxes, Russian hand carved boxes, Belarussian straw inlay boxes and even Russian hand painted eggs, Ukrainian religious eggs, hand carves eggs, and gold plated Faberge eggs. We also have fine cloth items like Russian embroidery and linens, Russian wool shawls and silk scarves, etc. Ladies will certainly appreciate the beautiful Russian amber jewelry, amber pendants, amber brooches, amber earrings, amber rings, and amber necklaces any maybe even enamel jewelry, known as Finift, including enamel earrings, enamel rings, enamel necklaces, enamel watches, enamel brooches, and enamel pendantsand agate and leather jewelry or even paper-mache jewelry. While you are Internet shopping in our Russian Island web site you can also enjoy viewing Russian pocket watches and very collectible Russian commander wrist watches. We would like to thank you for shopping at our Russian Island web site. Remember after a delightful shopping experience at Russian Island be sure to stop in our store, Taste Of Europe, for some delightful refreshments and Russian cuisine.